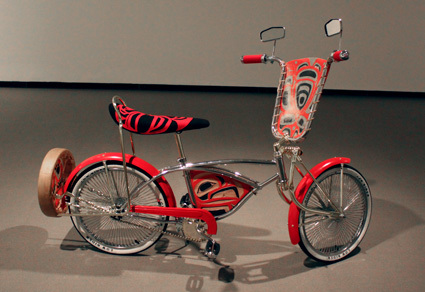 Dylan came to Vancouver as part of his Anishnaabensag Blimskowebshkigewag (Native Kids Ride Bikes) curatorial project, where he guides local Native artists through to process of building and customizing lowrider bicycles with Indigenous style artistic motifs. Four individuals, Trevor Angus (Gitxsan), Gabe Hill (Métis/Cree), Janeen Frei Njootli (Vuntut Gwitchin) and myself (Dane Za/Cree), committed to following through with the workshop series. Cosmically Dylan had brought along the parts to assemble four bikes and proposed that we focus on the teachings of the four directions for our bikes. Dylan Miner getting down to business with Gabe and Jeneen. After a brief intro about the project we delved headfirst into bike building. Using supplies Dylan had brought along as well as personal objects supplied by the artists we went about developing our masterpieces. Community members dropped by to support and lend a hand when needed and after only four short sessions we managed to finish our bikes. Myself and Jeneen working away with Carrielynn Victor and Agnes Jane Wisden. 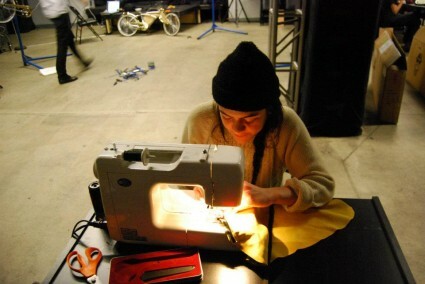 Gabe Hill sewing her custom hide seat cover. 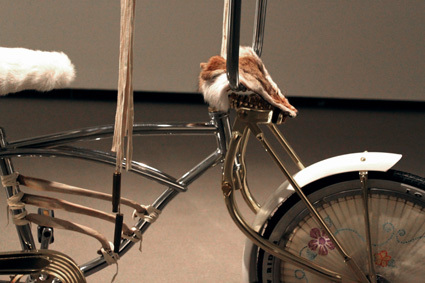 The bikes will be featured as part of a larger Beat Nation show, taking place at the Vancouver Art Gallery. 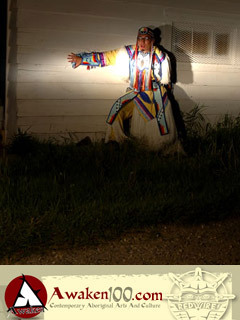 The Beat Nation features Indigenous artist as well as musicians and performers and it looks awesome. Come check it out! Eagle painting on drum by Gitxsan artist Trevor Angus and Carrielynn Victor. 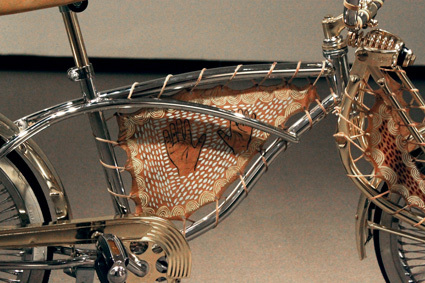 Detailing on Jeneen’s rawhide bike. 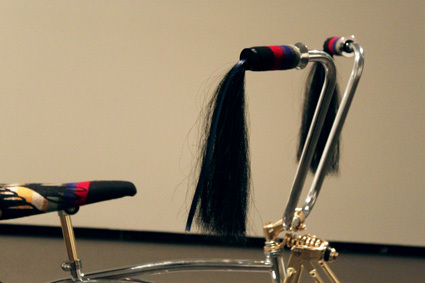 Horse hair handle tassels on my bike. Painted elk hide on Gabe’s cruiser. My custom seat cover, featuring a thunderbird pattern Pendleton blanket. 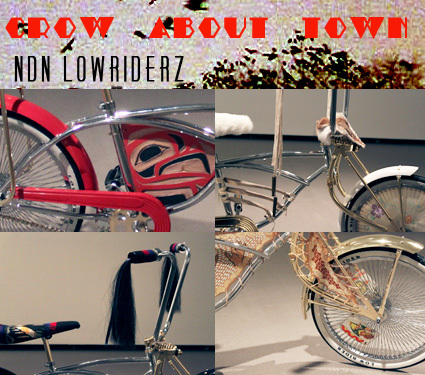 Big thanks to the Vancouver Art Gallery, Tania Willard, Dylan Miner, Carrielynn Victor, Agnes Jane Wisden and Yvonne Prince! 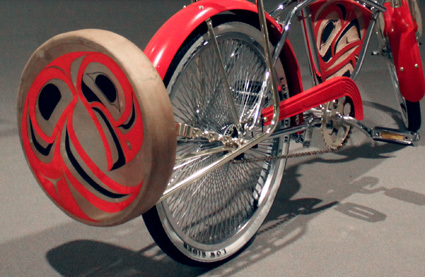 Check out the finished bikes! 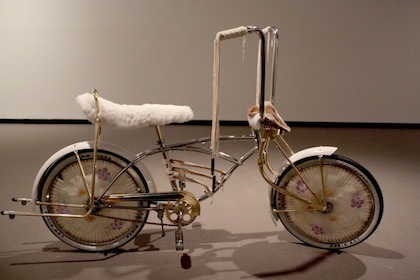 White bike by Jeneen Frei Njootli. Red bike by Trevor Angus. 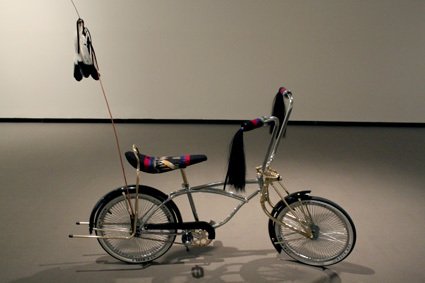 Black bike by Julian Napoleon. 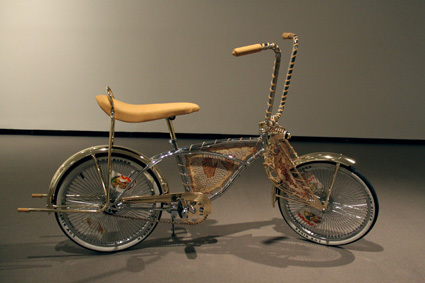 Yellow bike by Gabe Hill.